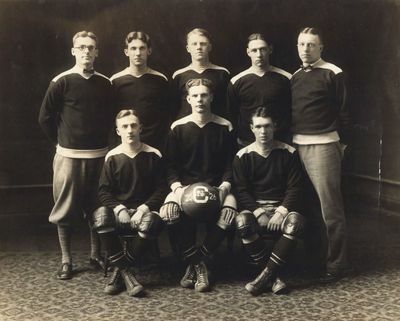 Varsity team photograph. First row: R. Lattimer, T. Morrissey, Co-captains G. Konopski and D. Heffron, P. Fernandez, T. Gaskill. Second row: Head Coach A. Stockholm, P Richards, J. Tattle, B. Lewis, P. Scherer, B. Sheahan, Manager J. Brewer.